Found this old hinged lidded plywood box (below) at a late summer garage sale. Thought about it for a few weeks, moved the box from one pile of stuff to another. It was headed out to the shed next. Got a wild hair. I love German striped grain sacks. 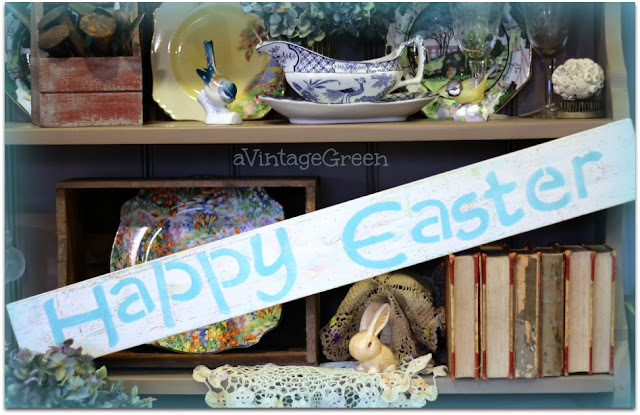 Love seeing them on Miss Mustard Seed, love seeing a huge variety collected on a board by EdithEvelyn Vintage on Pinterest. 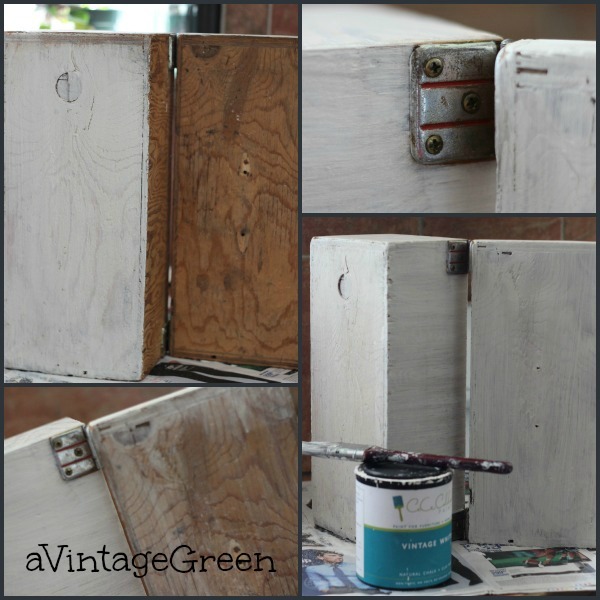 Used a lightly wet brush and a bit of chalk-clay paint to give the box a wash inside and out (after removing the screws, handle and cleaning the dust and webs out of the interior). 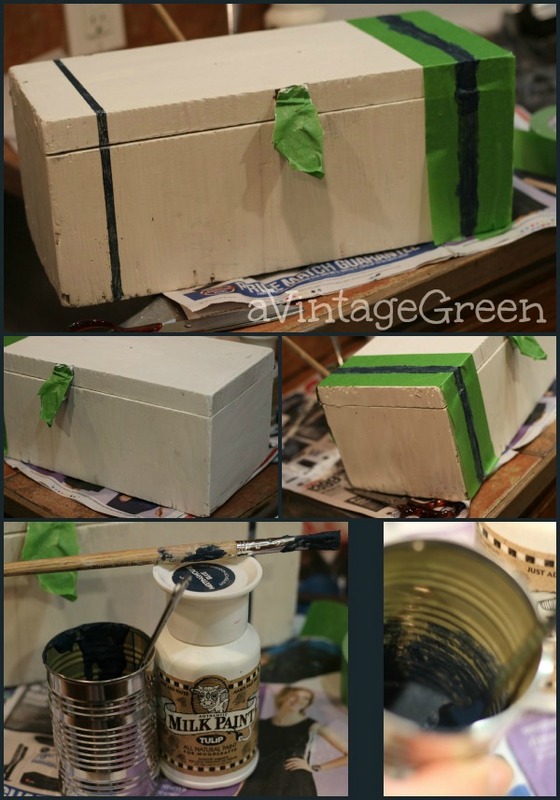 Gave the box a 2nd coat of chalk-clay paint. Dried it outside in the hot sun for awhile. First try using milk paint. This is just cheap craft store paint (bought at a garage sale) and it is no relation at all to Miss Mustard Seed Milk Paint. NONE. Mixed the powdered paint with water (1-1 ratio) in a clean tin, added a bit more water, mixed with a fork. Let it sit for awhile, mixed some more. Taped the first stripe area. Painted. Removed tape right away. Seemed ok. Added a stripe to the other end. Some bleed through. Might deal with that later, maybe not. Plywood is pretty rough so a consistently good edge seal didn't happen. Added more lines. You can see the first lines showing through the tape, handy for getting the spacing somewhat the same. Trying for the German tea towel look. Still looking for a piece of well used leather for a handle. 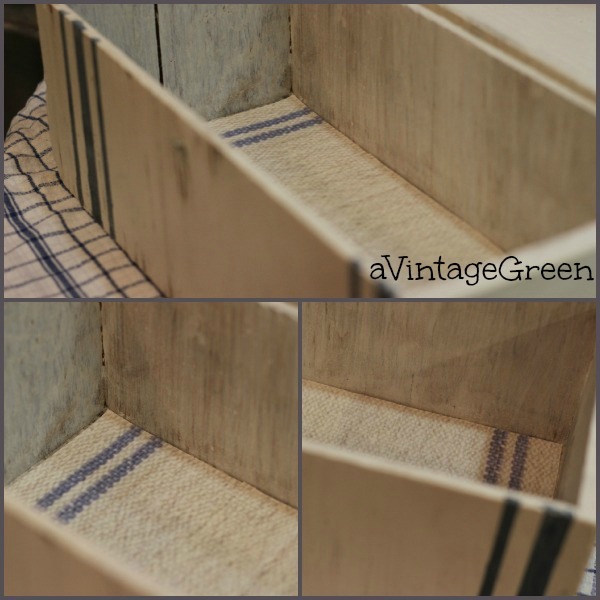 Lined the box interior base with printed faux grain sack paper. Grain sack .jpg from Knick of Time. Adapted it in a post on faux grain sack banner letters last October. I printed out two faux pages and trimmed them to fit into the interior base of my box. I am in L.O.V.E. Vision to completion. 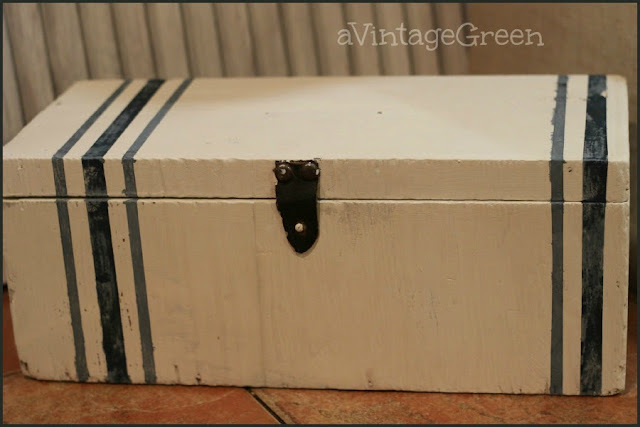 Thank you for checking out my faux grain sack stripes on vintage white box. I dream of finding an authentic German or French striped grain sack or tea towel at an incredible garage sale. Ha, like that is going to happen. Nice dream though, sort of like thinking I will find a box of chintz or petal ware just waiting for me. Love that box! You did an awesome job on it. How are you feeling? Hope it's good! Joy, you are absolutely brilliant! There are no others like it, but I predict there soon will be many copies! You're having fun. Joy what a huge change in that box! I love it and what you did! Great job. Thanks for sharing at TTF! Oh, Joy....literally! It's spectacular! You did such an awesome job on it! I was just sitting here trying to get motivated to go mix up some chalk paint and paint a mirror and bench I have sitting in the other room. I think you just gave me the "oompf" I needed! Thank you. Don't give up on those dreams! I love boxes too Joy and yours turned out just fabulous!!! 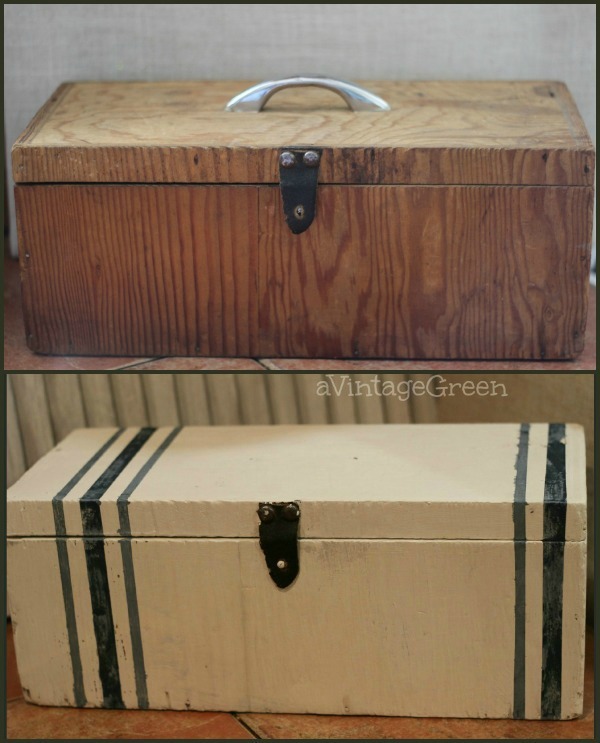 The trunk/box is lovely. What a transformation. I was not bless with a DIY gene like you are. It looks gorgeous. Amazing the work you do with you finds! Yes, I am still looking through piles of fabric at estate sales hoping a grain sack has been overlooked! The toolbox turned out beautiful love how you finished the inside. Joy, the box is awesome now! I've found good leather for handles from belts at the thrift store. Wow the box turned out great. It kind of made me think of a old army blanket. Joy, that was brilliant! I love old boxes and have painted quite a few. The addition of the grainsack paper makes it perfect. Came over from Twigg. 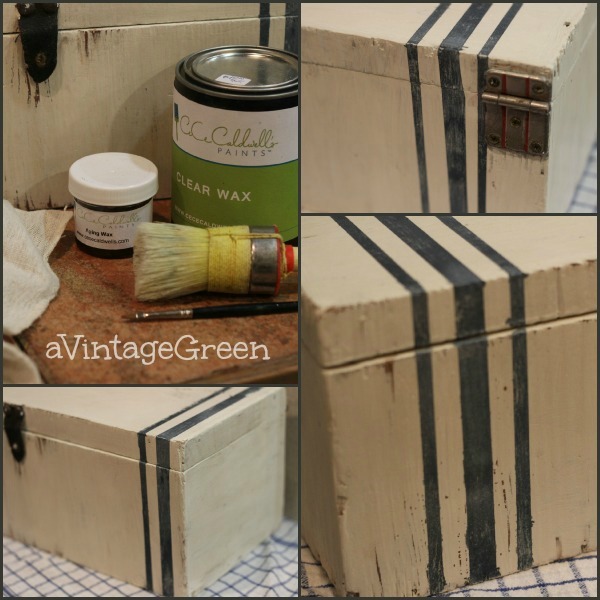 I love your old box with the stripe. 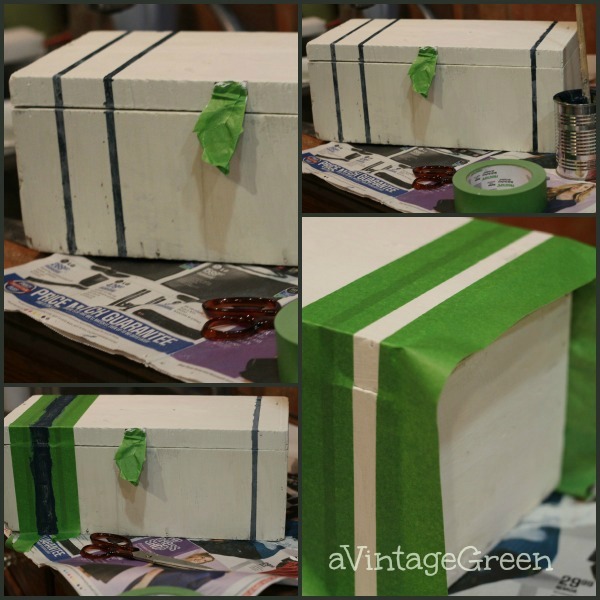 I found an old green box in my parents' garage so I taped off a stripe to keep the green and painted the box white. I love how that one stripe is there. Love the box, very cool!! This turned our really nice Joy. You are so creative. Love how you printed out your lining for the box too. Angie really offers nice files/graphics for us to use. I have several old plain painted boxes I need to 'stripe'. Thanks for the idea. Hope you are feeling great and getting stronger every day. It turned out really great, and what a cute box it is! Now it has the character it's always was meant to have. very cute makeover - I don't have the patience for such things! I love buying up boxes since I buy lots of smalls that I enjoy having & can't currently display in my apartment, but when we have a house, things will be different. Thank you for your informative comment in my blog. I am off to do some more research on it. I appreciate it. nice rework!! 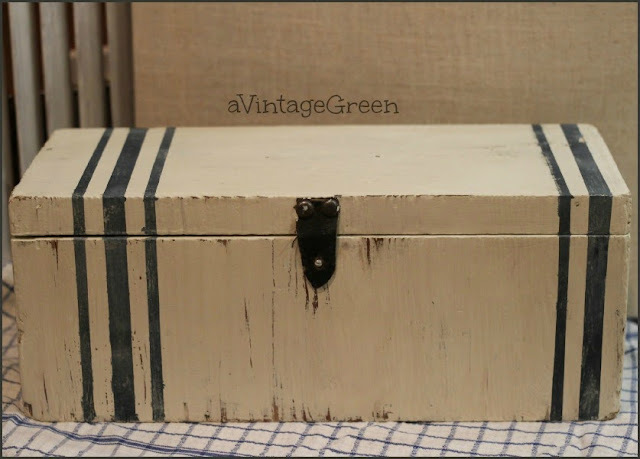 what a fabulous wooden box! Your before/afters always inspire, I need to get crafting/drawing/making again! HI Joy, I was reading your comment on another blog, it's been a while since I visited, but I didn't know that you were not well. Sending you good wishes for feeling better soon. What a transformation! I have been collecting old wooden things to paint but just am too chicken to start. I want to use chalk paint but again, chicken! Thanks for sharing this! Visiting from A Bouquet of Talent! I saw this at Cedar Hill Ranch and had to come over. This is amazing! I love grain sacks too...in fact I have an Etsy shop and repurpose them into pillow covers and other soft furnishings. Out of curiosity would you be interested in a trade? 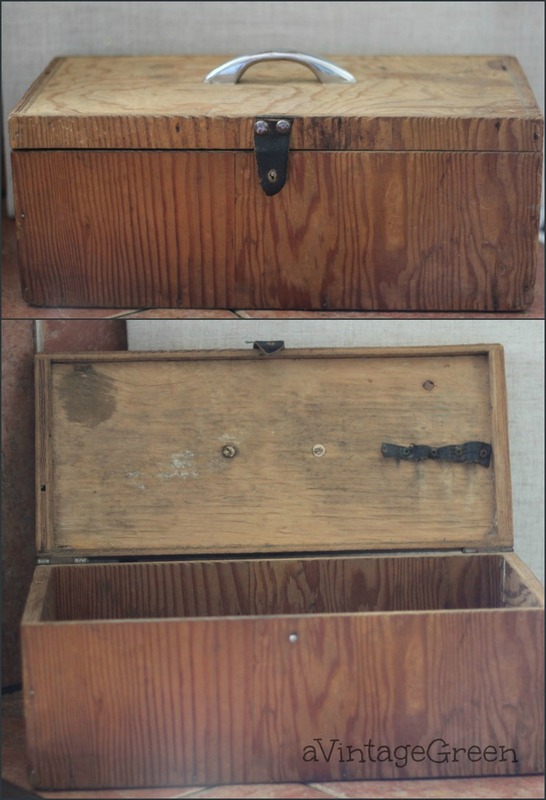 A box like this (doesn't have to be this exact one) for one of my grain sacks? Love the before and after. such a lovely transformation. I admire your talents. Looks great! Like it was found that way!. Wonderful job. LOVE your box! You did a great job. Wow! Love your box, fantastic job! Yay! A fellow box lover! I don't know why, but I'm like you and I'm always looking for stuff like this. You're makeover is brilliant, I love the stripes. I does nothing to take away from the vintage look, only enhances it! Well done! Love the coloring you chose and the liner on the inside is great! What a great transformation! I love it. Love this transformation! Great job! Thanks for linking up to TTF! I have a thing for old wooden boxes and this turned out great! Thanks for sharing. Oh, I love it, and so did lots of others! You had one of the top views last week at A Bouquet of Talent. Thank you so much for sharing with us. Always thrilled to have you party with us! WOW, what a GREAT transformation! Such a charming little box. Joy, I love old feed sacks, so this hit it out of the ball park for me! I have been wanting to do this on something for a while now. Just haven't found that something yet. Your box turned out fabulous! Thanks for sharing it with SYC. Joy, your box looks fabulous! Your grain sack box is perfect in every way. Thanks for linking up to Tickled Pink Times Two! Hi Joy, just hopping by to let you know that I will be featuring you at SYC.